Egyptian President Mohamed Morsi (L) and Israeli Foreign Minister Avigdor Lieberman, (Photos: AP and Reuters). Israeli Foreign Minister Avigdor Lieberman said on Tuesday he hoped Egypt's new Islamist President Mohamed Morsi would soon visit the Jewish state to back up his reassuring words. Morsi told Reuters in an interview on Monday he would pursue a "balanced" foreign policy and indicated that Israel's peace treaty with Egypt was safe. "We definitely hope to see President Morsi receive official Israeli representatives in the near future. We want to see him interviewed by the Israeli media. We want to see him visit Jerusalem as a guest of President (Shimon) Peres in Israel," the ultranationalist Lieberman told a legal conference in Tel Aviv. Morsi's Muslim Brotherhood movement describes Israel as a racist and expansionist state. But the president resigned from it upon taking power after his election victory in June and he has avoided inflammatory language since. Morsi's emphasis on balance in the interview with Reuters suggested he would seek a less explicitly pro-American role for Egypt in the region than under the ousted Hosni Mubarak. But he has also been at pains to reassure traditional allies. Egypt and Israel made peace in 1979 after fighting four wars. Mubarak served for decades as a loyal U.S. ally and guarantor of Egypt's status as the first Arab country to sign a treaty with Israel. Relations have remained cool despite the treaty, which is deeply unpopular with many Egyptians. 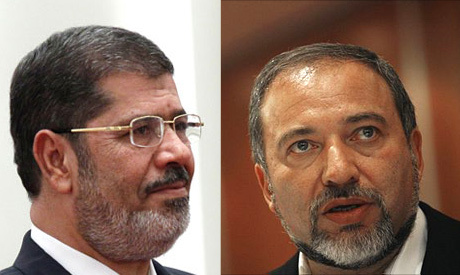 Lieberman said Morsi's words of reassurance were pleasing but he needed to do more. Without mentioning Israel by name, Morsi indicated that Egypt's neighbour had nothing to fear from a new military campaign in the Sinai Peninsula, which he ordered after gunmen attacked an Egyptian border post, killed 16 guards and tried to storm across the frontier into Israel. "I was happy to hear what ... Morsi said on Egypt's commitment to peace with Israel, the Camp David accords and the fight against terror," Lieberman said. "It's a very important message. But whoever speaks of peace and stability must understand that this can't just be abstract and hypothetical. Peace also has tangible expressions. Peace is not telepathic." Lieberman urged the Palestinians to hold a long-delayed election to choose "a new, legitimate, hopefully realistic" leadership that can "bring progress with Israel". Netanyahu swiftly distanced himself from the comments saying that they did "not correctly represent the position of the prime minister or of the government as a whole". Minister Avigdor Lieberman was high on Vodka. He did not know what he was talking about. The truth is Egyptians KEEP out of our country. We don't need you Crazy Primitives to visit Israel. Screw them, they deserve no special treatment.